My first encounter with kim chi wasn’t a good one; I thought it looked awfully red, mushy and sloppy. That was more than 3 years ago, at a small Chinese supermarket in the UK. Then again, that supermarket didn’t exactly have the freshest items available. The kim chi was probably lying there for a while, like a few dusty cans of kaya (coconut jam) I saw on the shelf nearby. With the number of Korean restaurants and mini marts mushrooming around Hartamas and Mon’t Kiara, I got to try fresh kim chi (by ‘fresh’ I mean kim chi that doesn’t look like it’s been there since the 80’s), and loved it. 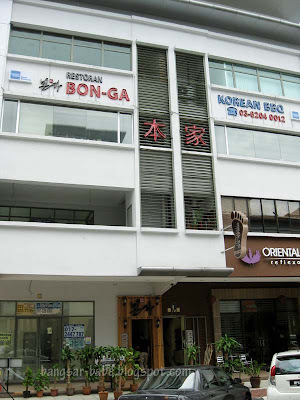 I usually go to Little Korea when I crave Korean food, but rif suggested we try Bon Ga, located a few blocks away. The menu isn’t as extensive as Little Korea’s, but they have the basic grilled items and soups. I noticed Bon Ga serves more seafood dishes than meat. Since it was just the two of us, we ordered a portion of Samgyeopsal (pork belly) and Kimchi Jeongol (kimchi soup) to share. As usual, the meal came with some complimentary ban chan (side dishes), we got 13 of them. I liked most of the ban chan, but the ones that stood out were the kim chi, salted lettuce and green chilli in bean paste. 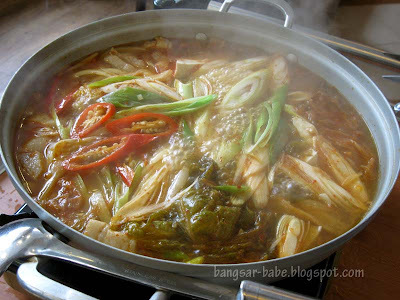 Kimchi jeongol (RM35) is basically the same thing as kimchi jjigae. Only, it is served in a bigger pot. I reckon the pot was enough to feed 3 people. There was plenty of white tofu, chunky pork belly, kim chi and onion slices, and the soup had just the right amount of sourness, sweetness and spiciness. 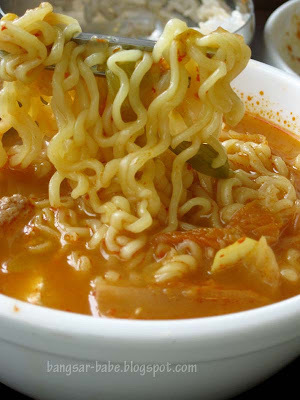 We were also offered a large packet of instant noodles to add to our soup. Despite being soaked in kimchi broth for more than 10 minutes, the noodles remained firm to the bite. I enjoyed this very much. 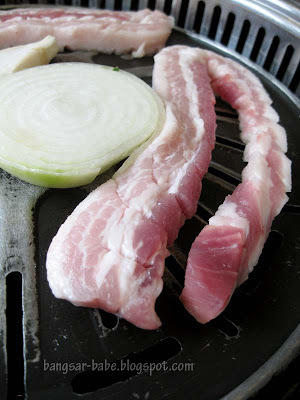 When it was placed on the hot grill to cook, the Samgyeopsal (RM25) looked and smelt very good. Grilled till it was slightly crisp on the outside, the 3-layered pork belly was incredibly tender. This tasted even better when dipped into some doenjang (soy bean paste) and wrapped with lettuce. 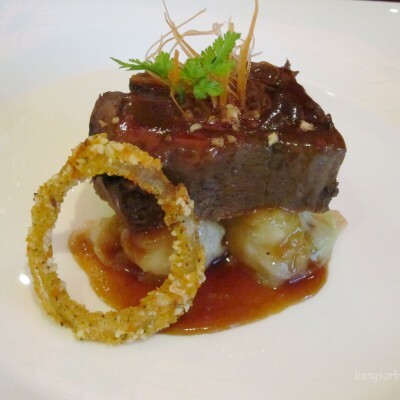 The portions were generous — I reckon the food above can easily feed three. However, there were some minor gripes. So far, the Korean restaurants I’ve patronised serve their diners a bowl of sikhae (Korean sweet rice punch) after the meal. Bon Ga didn’t. 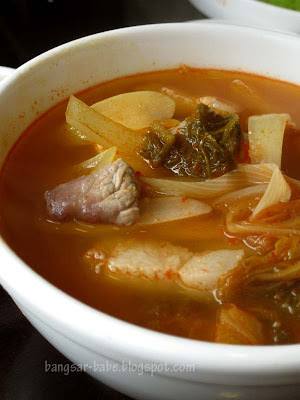 After eating the grilled pork belly and spicy kim chi soup, it would be nice to have something cooling. I also felt very thirsty after the meal — they probably went overboard with the MSG. I didn’t try the other grilled items, but based on what I ate, I reckon Little Korea is still better. And I didn’t feel thirsty after eating there! Verdict: While the food was decent, I’d still go back to Little Korea whenever I crave for Korean food. nope none of the korean restaurants have served me barley drinks, i have been conned! in fact, I cant find the roasted barley drink in most Korean outlets. or maybe they're not on the menu. oo… i passed by this place quite a number of times. Glad that u reviewed it. Would love to give this a try, see if it can beat daorae or nak won 😉 Haven't been to Little Korea yet too. dulu pun tak suka Korean, but after Korea Hse in SS2, i'm a convert! 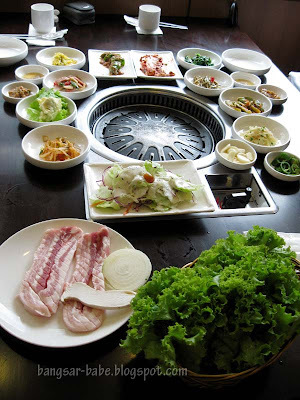 Hmm.. must try Little Korea di like tht! Christine – Little Korea is relatively small, but I find the food satisfying. 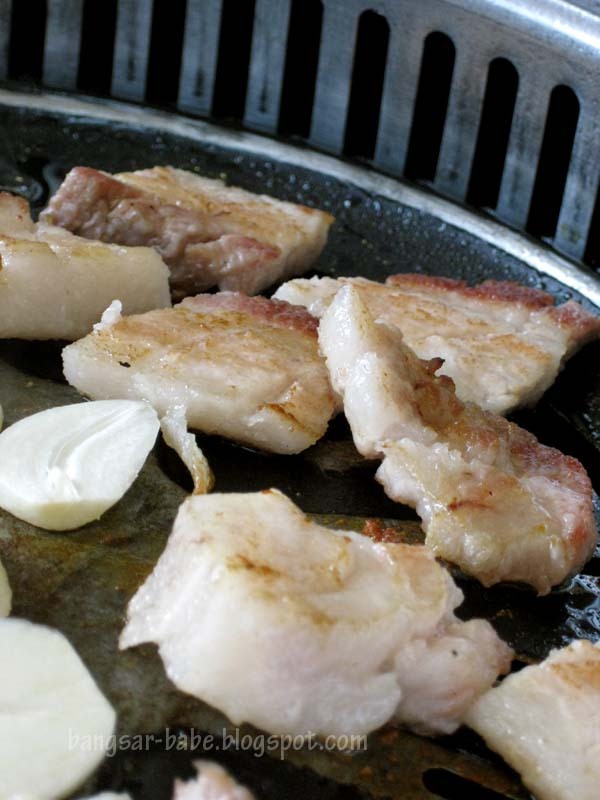 taufulou – I guess it is the way the marinate the meat that makes or breaks the food. J2Kfm – It's usually complimentary. So it won't be on the menu. So far, this is the only Korean restaurant I've gone to that didn't provide the barley drink. As for the kim chi, what I meant by 'fresh' is kim chi that isn't covered in dust. i don't eat pork, but i surfed on your website by accidents (result of google) and can i say thank youuu for your reviews of local food! 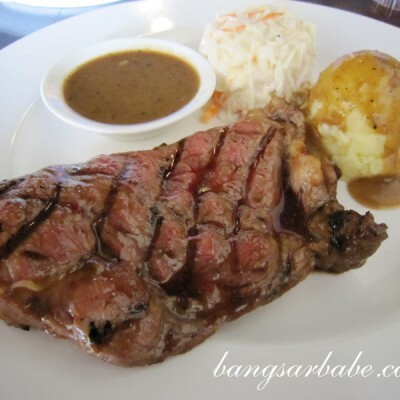 will try out some of the places you reviewed with my girlfriends =) especially solaris, i'm not really familiar with that area so your reviews are helpful. and i would love if you could do a review of rasta @ ttdi, see how you will like it or (hopefully) bash it! keep on doing the great work. We used to frequent an unstairs Korean joint in Telawi Bangsar last time ( near Castle )where they give sweets. We only remember the charred beef & the awful pickled vegetables but the colorless wine was terribly strong which left one or 2 of us stranded in the Jln Bangkung area for some hours ! Aahhh ! 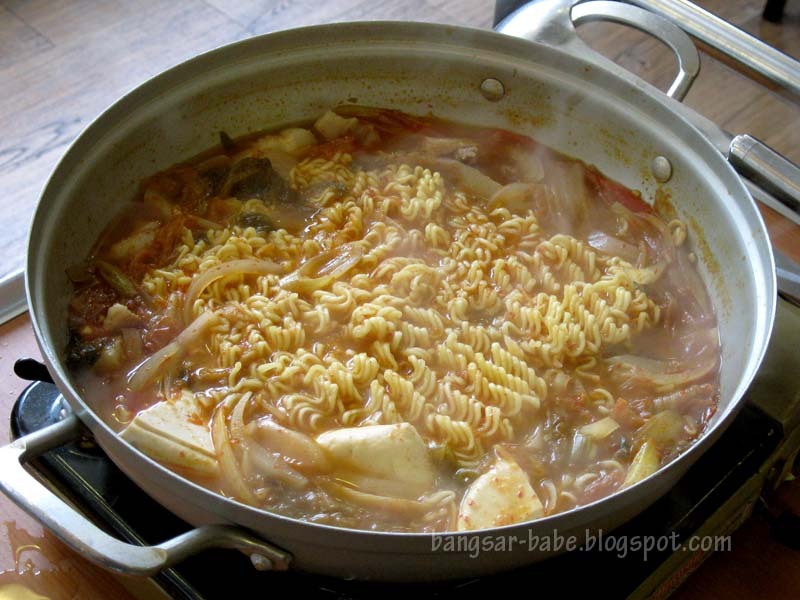 Korean food – so different from them ladies , no ? Authentic Korean restaurants usually serve the barley drink at the end of your meal. 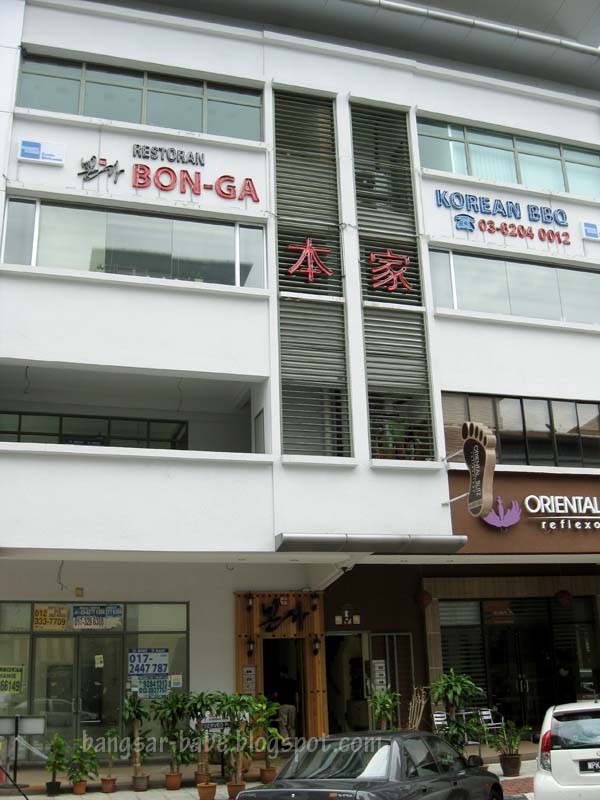 Go check out the restaurants in Ampang's Korean town. junee – Thanks for dropping by. Keep on reading! As for rasta, I've been meaning to pay that food court a visit, but haven't found the time to do so.